Our warmup is your workout. Over the last two years I’ve really struggled with the amount of time I spend on thinking about and engaging in Crossfit. The time I want to spend on it is not the time I have. I’ve struggled with this balance for over two years. My time with my girls is hard to come by and I find myself having to sacrifice other things, especially Crossfit, in order to just hang with them. 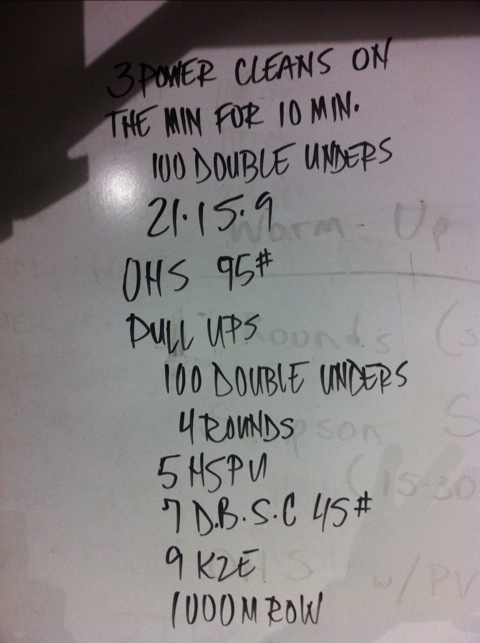 I was supposed to meet friends at the box to do the pictured wod. But I also had to get my girls ready for school. To be able to do both I had to enlist the help of my father to drop the girls off to school. Feeling guilty about my selfish decision to Crossfit instead of dropping my girls to their school steps, I dilly-dallied this morning, hanging out with the girls a few more minutes before I left for the box. As a result I was late to wod with my homies. So instead, the wod became my warmup, greatly modified. Instead I decided to re-do “Camille”. The first time around I did it with friends at Brazen Athletics sort of half-assed. In fact, I wasn’t even going to do it then. But it was something about seeing my friends attempt the wod, suffer through it, miss some reps and then be blasted at the end, that made me want to jump in. It’s one of the weirdest things about this Crossfit community. Things you never have done or just unlikely to do, you do because this community provides one of the greatest support systems I’ve ever seen. This morning for instance, I had no plans of re-doing “Camille” but my cronies stayed behind just to cheer me on while I did the wod. I had to do it at that point. Within in the wod I wanted to stop several times saying to myself, “I don’t want to do this.” But the voices in the background saying, “C’mon Ben!” motivated me to continue. In football we call the crowd The 12th Man. When the 12th man is making noise he can motivate the team to extraordinary feats. In every Crossfit box around the country, there’s the 12th man. Some voice or voices you hear bellowing from the corner urging you to keep pushing. I love this community. Sometimes stealing a little time away from parenting feels worth it.